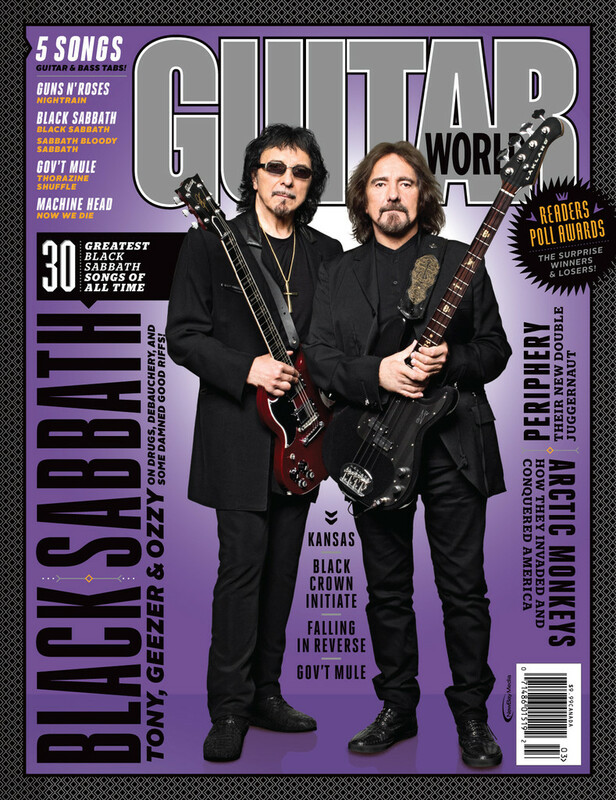 Great to see the Guitar World cover and article, I’d almost forgotten we’d done it! Below is an excerpt from the article. The magazine itself can be purchased at this link. In 1971, you released Master of Reality, which saw the band experimenting a bit more with tracks like “Solitude” and the acoustic instrumental “Orchid.” Tony, had you always played acoustic or did you pick it up around that time? TONY IOMMI No, I never played acoustic that much at all really. I don’t even remember where we did that track, to be honest. I think the idea on the album was to have a bit of light and shade and relax it from the heavier stuff. Speaking of heavier stuff, what were you coughing on during that intro to “Sweet Leaf”? IOMMI [laughs] I choked me bloody self! It wasn’t intended to happen, and it wasn’t supposed to be on the track. We were in the studio tracking that song, and Ozzy gave me a joint and I nearly choked myself. The tape was on, so of course they wanted to use it to begin the track. Tony, I have been a fan since around 1979, I have always admired your passion for the band. The cancer has had an impact on your life, but you know what, you just keep going. Inspiration to us all. Great material, glad to have a copy. Guitar World’s ranking of Sabbath’s 30 best songs is a joke, though. Snowblind at #20? War Pigs at #10? Children of the Grave at #17? Give me a break. Such rankings, to be sure, will always be a matter of personal taste; but this is a little silly. Methinks they didn’t want to appear predictable by having the obvious choices at the top of the list. In this, they were totally predictable. awesome had tears in my eyes. Fan since 1973 and still going. Great comment! Tony is #1! Toni. Grew up with your music. 56 now. Would like to shake your hand and say thanks for all the relaxation you have brought to my life. Couple of mates of mine were at the same boarding school (for poor uk armed service kids ) would like to do the same. Cheers chap. I have been a lifelong Sabbath fan. Saw you in 1981 for the Heaven & Hell album, the reunion tour in 2000 and the End tour 4 times. My favorite band for the past 40 years. You are indeed the Master! Thank you so much for everything you’ve given to us. I’ll be cranking Black Sabbath as load as possible well into my 90’s.